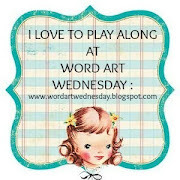 Word Art Wednesday last week! freebie I'd downloaded from Lilac & Lavender. Awww, these are so sweet! Both your birds are so sweet, love the use of the doily's too! I love the color combo used in the first card! So sweet. Michaels has colored doilies in the $ spot. I just saw them today and wondered how I could use them. Ahh thee are so lovely, do love Birdee cards, well done. Also love the ones below, for less is more. Cute cards! A little birdie told me you won some prizes (3 digital items from Stamprints) at Creative With Stamps! Congratulations! You can e-mail me with your choices using my contact form at my blog!